The next step in the process that started with Google's announcement that it planned to buy Motorola Mobility will take place on November 17th. On that date, Motorola Mobility will hold a special meeting for shareholders to vote on the acquisition of the company by Google. 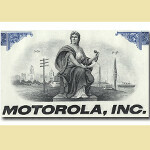 Those who were Motorola Mobility shareholders at the end of the business day on October 11th will be allowed to vote. Motorola Mobility sent out this information in its latest proxy to stockholders. The special meeting will be held at 10am local time at the Hyatt Regency La Jolla at Aventine in San Diego. Google announced its offer to buy Motorola Mobility for $12.5 billion on August 15th. That works out to a per share price of $40, which was a 63% premium to the price of Motorola Mobility the day before the deal was announced. The deal is expected to close late this year or early next year and is considered a cost effective way for Google to defend itself in the current patent wars with Apple by picking up the approximately 17,000 patents that belong to Motorola with another 7,500 in the process of being issued. It has to be done to protect ANDROID. APPLE would love to turn everyone into a mindless iDRONE and they hate competition. i also like APPLE for eating..! Not to taking it in my pocket as a phone..! :p Android is best..! The biggest question here is "will google start to manufacture all its own devices if it owns Motorola? Although they do make nice phones, I think it's the variety of device offerings that allowed Android to climb past the almighty iPhone.